The Scenic Inspiration Behind "M-22"
Sand dunes, lighthouses, small towns, and Lake Michigan highlight the 116-mile drive along the state’s most notable highway. 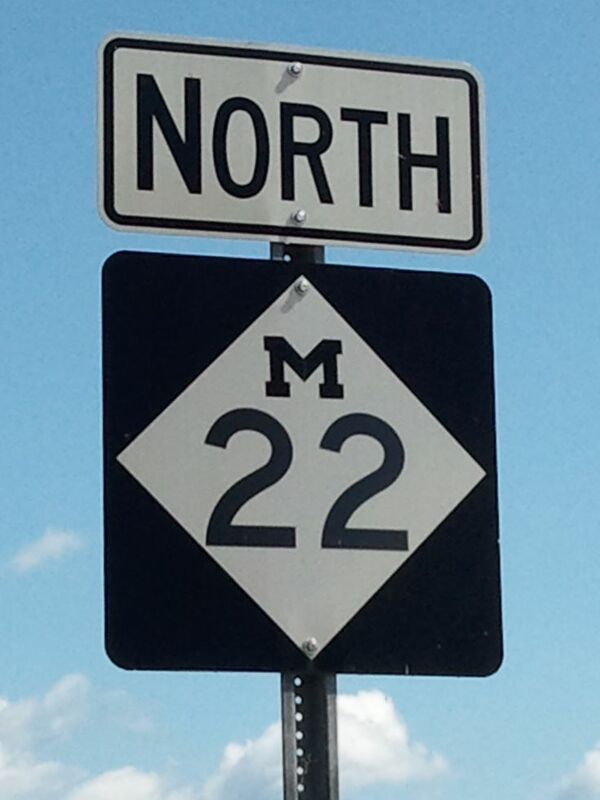 For Northwest Michigan locals, M-22 is a point of pride, and the sleek black road signs have become a regional symbol. The Michigan Department of Transportation even had to take measures to stop the theft of signs from the historic highway, as it has become so widespread! For tourists, the scenic highway is a must-drive while passing through. There’s no need for a tour guide, and you can leave your travel book in the glove box. M-22 will take you right through all the destinations you want to see. It’s been called “one of the most beautiful drives in America,” and, in 2015, USA Today readers voted M-22 as the “best scenic autumn drive” in the country. It stands to reason. The highway passes through some of Michigan’s most popular tourist destinations and the state’s most illustrious National Park, Sleeping Bear Dunes. Even when it meanders away from the lake and Leelanau Peninsula, a drive down M-22 gives a glimpse into the scenery and small-town life in Michigan’s northern lower peninsula. The 116 miles span from Manistee in the south, loop up through the popular tourist destinations in the Leelanau Peninsula, and finishes in Traverse City, “The Cherry Capital of the World.” Overall, drivers will pass through three counties: Manistee, Benzie, and Leelanau. Each stretch of the drive has it’s own charm and sights to see. The southernmost stretch of highway though Manistee County will bring you through farmland, forests and small towns. While traveling M-22, you can stop off in Manistee, Onekama, or Arcadia - each small town offering its own individual atmosphere and claims to fame, but all representing Northern Michigan. A must-stop is the Arcadia Overlook, or “Inspiration Point,” which offers stunning views of Lake Michigan and the shoreline. After driving a little farther north, you’ll come to Frankfort in Benzie County, a small town set on the shore of Lake Michigan. In Frankfort, visitors can walk the beaches and visit the Frankfort Lighthouse, or hang out downtown and check out the local shops, ice cream spots, and restaurants. Farther north traveling on M-22, you can check out the Point Betsie Lighthouse, one of Michigan's most photogenic lighthouses. The Leelanau Peninsula is home to Sleeping Bear Dunes National Lakeshore, which has been named the most beautiful place in America, and holds up to its reputation. The fresh air from Lake Michigan and the scenic views combine to make it a truly incredible experience. Farther up, near the tip of the Leelanau Peninsula, you can stop in at Leland’s Fishtown, a historic small town with museums, gift shops, and ferries to the Manitou islands off the coast. You can pull off to any number of small towns on the Leelanau Peninsula and enjoy yourself: Glen Arbor, Northport, Suttons Bay - but be sure to include Traverse City in your plans, to enjoy our clear blue waters and incredible beaches. A drive on M-22 is something that is truly incredible to experience, and lives up to the hype, whether it is on a warm summer day or to see the changing colors in autumn. Take a piece of this historic highway home with "M-22" by Northern Nail Polish. About the article author: Bryan Finnigan is a Michigander and a professional journalist and copywriter. He's passionate about history, the outdoors, and lifetime learning. Do you have a passion for the places, people and things that make Michigan so beautiful and unique? Does a certain thing about Michigan hold a place in your heart, and you'd like to see a color inspired by it? We are looking for your ideas and favorite things about our wonderful Great Lakes State! Reach out to us here at NorthernNailPolish@gmail.com! We may even feature your ideas and stories about what Michigan means to YOU!